According to the reputed media outlet ESPN, Real Madrid Galactico James Rodriguez will stay at Bayern Munich until the end of the 2018/19 season to complete his 2-year loan spell from Los Blancos. Despite interest from teams like Arsenal and Napoli, who were desperate to sign him in the current winter transfer window, the Columbian playmaker has decided to stay with the Bundesliga giants Bayern Munich. The 27-year-old Columbian is on loan from Real Madrid for 2 seasons with an option for Bayern Munich to make the deal permanent. Since his arrival in Munich, Rodriguez has proven pivotal last season under former Bayern Munich boss Jupp Heynckes but failed to be a regular starter so far under the tutelage of Niko Kovac. Although James Rodriguez has only made 5 Bundesliga appearances so far this season, he has scored 3 goals. Despite the limited game time this season, James Rodriguez's impact is matched by only a few players in the world. When the baby faced assassin gets going, he can change the complexion of a match in seconds and will be an outright asset in any team. 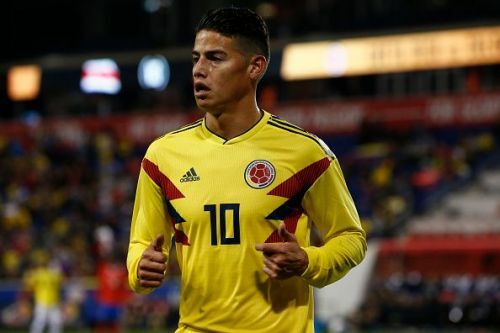 There were reports that James Rodriguez is unhappy with current boss Kovac and teams like Arsenal and Napoli were looking to take advantage by providing the player with a quick exit in January window. Napoli manager Carlo Ancelotti had a fruitful relationship with James when they worked together at both Madrid and Bayern especially with Rodriguez being a vital cog in the machine during 2014/15 when Ancelotti was the coach of Los Blancos. But according to the report, sources close to Rodriguez has said that the player is determined to stay put till the end of the season and even possibly extend his tenure with Bayern Munich. With the Champions League knockout tie against Liverpool in the corner, Bayern Munich simply cannot afford to lose a world-class match winner like James Rodriguez. Moreover, the squad depth plays a vital role for a team like Bayern Munich who will be competing for all competitions throughout the season. It still remains to be seen how James fits in Niko Kovac's tactics but the player might play a vital role for the Bavarians on their way forward in the current season.